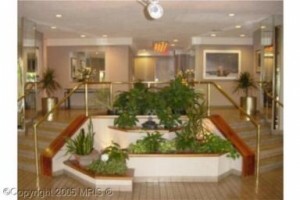 You Have to see this AWESOME Alexandria Condo! This is the life! This charming unit in the wonderful Pavilion on the Park is located in the heart of Alexandria and has everything you have been searching for! With a little elbow grease, earn instant equity with this one bedroom, 1 bath mid-century modern condo and fall in love with the open floor plan and hardwood floors! The main living area is light and bright and includes plenty of room for a dining area. Just off the living room awaits your over sized balcony with a fantastic view of Holmes Run Park. Back inside you will find an updated kitchen with storage space and a dishwasher! A generous sized bedroom, bath, and lots of closet space complete this home! All of this AND great amenities such as a relaxing pool, well equipped exercise room, parking, and most utilities included in your monthly condo fee! Plus, peace of mind with 24 hour front desk staff and security! Shopping is abundant and commuting is a breeze with a Metro bus stop just outside your door! Wait are you waiting for?! Call the real estate experts at Ask Gina & Company today and let us unlock the possibilities!